In my last post, I looked at Apple, arguing, with a Monte Carlo simulation, that the stock was a good investment at the prevailing market price ($93 at the time of the analysis). I appreciate the many comments that I got on the analysis, some taking issue with the distributions that I used for profit margins and revenue growth and some taking me to task for ignoring the fact that big name investors were either entering and exiting the stock. Those who felt that my valuation was optimistic pointed out that Carl Icahn, a long time and very vocal investor in Apple, had decided to sell his stake in the company on April 28. Some who concurred with my value judgment on Apple pointed out that Berkshire Hathaway (and by extension, Warren Buffett or his proxies) had invested in the company on May 16. 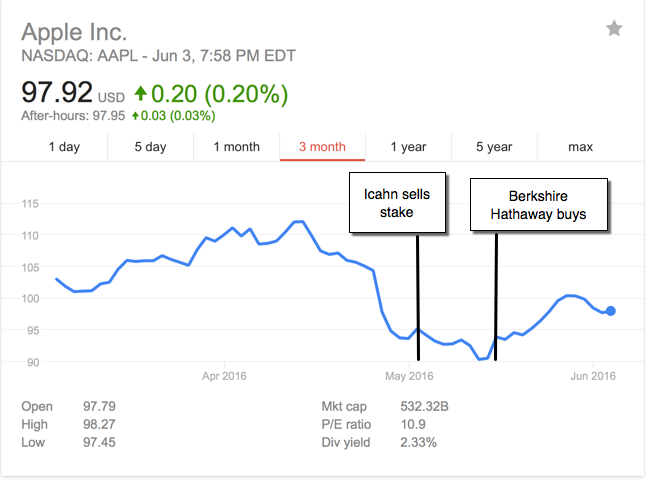 Should Carl Icahn’s decision to sell Apple or Berkshire Hathaway’s choice to buy it change my assessments of value or views on its price? More generally, should the decisions by "big name" investors to buy or sell a specific company affect your investment judgments about that company? To set up the discussion of whether, and if so how, the actions of other investors, especially those with big names and reputations to match, affect your investing choices, I will fall back on a device that I have used before, where I contrast the value and pricing processes. Put simply, the value process is driven by a company's fundamentals (cash flows, growth and risk) or at least your perception of those fundamentals, whereas the pricing process is driven by demand and supply, with mood, momentum and liquidity all playing big roles in determining price. In an earlier post, I argued that it these processes that separate investors from traders, with investors focused on the drivers of value and traders on the pricing process, and that the skills and tools that you need to be a successful trader are different from those that you need to be a successful investor. To understand how and why the entry of a big name investor may alter your assessments of value and price, I would suggest categorizing that investor into one of four types. An Insider, who is either part of management or has privileged access to management. An Activist, who plans to change the way the firm is run or financed. A Value Investor, who has valued the company and is willing to take a position based upon that value, on the expectation that the pricing gap will close. Each type of big name investor has the potential to change how you view the dynamics of price and value, though the place where the change occurs will depend on the investor type. The entry (or exit) of a big name insider or big name activist can alter your estimate of value for a company, by either changing your perceptions of cash flows, growth and risk or by having the potential to change the company's operating and financing characteristics. As a trader, the entry or exit of a big name trader may cause you to move from one side of the pricing game to the other, i.e., shift you from being a buyer to a seller. Finally, as a long term value investor who believes that a stock is mis-priced but has little or no power to cause the pricing gap to close, the entry of a big name value investor can provide a catalyst for the correction. If you asked a value purist whether the actions of other investors affect his or her value, the answer will almost always be "of course not". After all, the essence of intrinsic value is that it is determined not by what others think about the company but the company's capacity to generate cash flows over time. That said, there are two ways that the investment action (to buy or sell) of a big name investor can change your assessment of value. The first is if the big name investor has private information or is perceived as knowing more about the firm than you do. While that may walk awfully close to the insider trading line in the United States, it is entirely possible that the investor's information is diffuse enough to not be in violation of the law. In this case, it is entirely rational for you, as an investor, to reassess your cash flows and risk, based upon the insiders' actions. That is perhaps why we are so fascinated by insider trading, where the perception is that insider buying is value increasing and insider selling is value selling. In some emerging markets, where possessing proprietary information is neither illegal nor unusual, and the decision by an investor who is perceived as having this information (an insider, manager or family member) to buy (or sell) is an indicator that your value should be increased (decreased). To the extent that you believe that the company will have to respond to activist pressure, your assessment of value will change. An asset restructuring can alter he cash flows and risk characteristics of a business, changing your estimate of value, though the direction of the value change and its magnitude will depend on how you see these operating changes playing out in cash flows and growth. Adding debt to your financing mix can add value to a firm (because of the tilt in the tax code towards debt) or destroy value (because it exposes companies to bankruptcy risk). If you are valuing a company, the entry of a big name activist investor in the ranks with a history of pushing for more debt could lead you to reassess your value estimate as well. Returning more cash to stockholders in special dividends or buybacks can change value either upwards (if the market is discounting the cash on the presumption that the company would waste the cash on bad investments/acquisitions) or downwards (if returning the cash will expose the firm to default risk or substantial financing costs in the future). In some cases, the big name investing in the stock is a trader, doing so on the expectation that momentum will either continue, sustaining the pricing trend, or that momentum will reverse, causing the trend to reverse as well. Since this trade is not motivated by either new information or the desire to change how the company is run, there is no value effect, but there can be a price effect for two reasons. The volume effect: If the big name trader has enough money to back his or her trade, there will be a liquidity effect, where a buy will push the price up higher and a sell will push it lower. The bandwagon effect: To the extent that there are some in the market who perceive the big name trader as better at perceiving momentum swings than the rest of us, they will follow the investor in buying or selling the stock. In contrast to a value effect, which is long term and sustained, the pricing effect will have a shorter half life. To the extent that the big name trader's time horizon may be even shorter, he or she can still make money from the bandwagon effect. To get a measure of the pricing effect of a big name trade, you have to look at both the resources commanded by the trader as well as the liquidity/trading volume in the stock. A trader with billions under his control investing in a lightly traded and lightly followed stock will have a much bigger pricing effect than in a very liquid, large market capitalization company. It is an undeniable and frustrating truth about value investing that for most of us, it is not just enough to be right in your assessment of value but you have to get the market to correct its mistakes to make money on your investments. If you are a small investor, there is little that you can do to close the pricing gap because you have neither the money or the megaphone to close the gap. A big name value investor, though, may be more successful for two reasons: he or she can take a larger position in the stock and as with the big name trader, create a bandwagon effect where other value investors will follow into the stock. Again, the magnitude of the catalyst effect will vary across both investors and companies. The extent of the impact on the pricing gap will depend in large part on the history of success that the big name investor brings into the investment, with sustained success in the past going with a larger impact. While it does look like Icahn's sale had a negative effect (albeit mild) and Berkshire's buy had a positive effect (almost as mild), I plan to use the framework of the last section to assess each of these investors and gauge how it should affect my thinking about the stock. Through much of his tenure, Carl Icahn has been labeled an activist investor but I will take issue with at least a portion of that label. It is true that Icahn is an activist, though he is much more active on the financing/dividend dimension (pushing companies to borrow money and return cash) than on the operating dimension. I do think that Icahn is more of a trader than an activist, more focused on momentum and pricing than on value and this is illustrated by the tools that brings to the assessment. When Icahn was asked why he invested in Lyft in 2015, his response was that it looked cheap relative to Uber, a classic pricing argument. With Apple, in his bullish days, Icahn argued that it was cheap, but consider how he justified his contention in May 2015, that Apple, then trading at $100, should really be trading at $240. In effect, he forecast out earnings per share in 2016 to be $12, applied a PE ratio of 18 and added the cash balance of $24.44/share. Not only is this definitely not an intrinsic valuation, it is at best "casual pricing", i.e., the type of pricing you would do on the back of an envelope after you have had a little too much to drink. The decision by Berkshire Hathaway to invest in Apple about three weeks after Icahn’s departure mollified some worried Apple investors, since there is no more desirable endorsement in all of value investment than Warren Buffett’s buy order. I am not privy to the inner workings in Omaha, but I have a feeling that this decision was made more by Todd Combs and Ted Wechsler, the co-heads that Buffett hired as his successors, than by Buffett, but let’s assume that they are following the Buffett playbook. What does that tell you about Apple stock? The good news is that the greatest value investor of this generation now considers Apple to be a value stock. The bad news is that this investor's biggest investment in a technology company has been in IBM, a company that delivers solid dividends and cash flows but has been liquidating itself gradually over the last ten years. If my value judgment on Apple had required substantial growth for value to be delivered, Buffett’s investment could very well have adversely affected my view on the company. In this case, though, I agree with his assessment that Apple is a mature company, with enough cash flows to cover dividends for a generation. 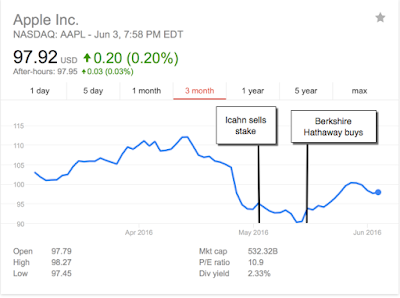 In early May, when I analyzed Apple, I knew that Carl Icahn had already closed out his position and it had no impact on my value estimate or investment judgment. Icahn’s decision to sell was an indication to me that the price might not recover quickly and that momentum could work against me in the near term, but I was okay with that, since my time horizon was not constrained. Buffett’s decision (if it was his) to jump in, a couple of weeks later, may be an indication that the best days of Apple are behind it, but I had already made the same judgment in my valuation. If there is a silver lining, it is that Buffett's followers, with their large numbers and unquestioning, will imitate him and perhaps get the price gap to close. While I am open to the possibility that the entry of a big name into a company has the potential to change the way I think about the company and perhaps my investment decisions, there are dangers embedded in doing so. Confirmation bias: It is a well-established fact that investors look for evidence that confirms decisions that they have already made and ignore evidence that contradicts it and big name investors feed into this bias. Thus, if you have bought a stock, you are far more likely to focus in on those big name investors who agree with you (and are either bullish on the stock or buy it) and screen out big name investors who do no. Mixed Motives: It is entirely possible that you (as an investor) may be misreading or misunderstanding the motives that caused the big name trade in the first place. In particular, the insider, who you assumed was trading because he or she had private information, may be selling the stock for tax or liquidity reasons. The activist, who you assumed was pushing for real changes in the company, may be more interested in collecting a payoff from the company to leave it alone. The trader, who you assumed had skills playing the momentum game, may himself be following the crowd rather than assessing momentum shifts. Finally, the value investor, who you assumed had valued the company and was pushing for the price/value gap to close, may be more trader than investor, quick to give up, if the stock moves in the wrong direction. There are some investors, including many institutional investors, whose entire investment strategy seems to be built around watching what big name investors do and imitating them. While imitation may be the best form of flattery, it is inauthentic and a poor basis for an investment philosophy, no matter who the big name investor that you are imitating is and how successful he or she has been. We are too quick to attribute investment success to skill and wisdom and that much of what passes for "smart" money is really "lucky" money. My advice is that if you have an investment thesis that leads you to buy the stock, do so and stop worrying about what the talking heads on CNBC or Bloomberg tell you about it. If you have so little faith in your reasoning that you doubt it and are ready to abandon it the moment it is contested by a big name, you should consider investing in index funds instead.
" since there is more desirable endorsement in all of value investment than Warren Buffett’s buy order. I am not privy to the inner workings in Omaha, but I have a feeling that this decision was made more by Todd Combs and Ted Wechsler, the co-heads that Buffett hired as his successors, than by Buffett, but let’s assume that Buffett was the initiator of this investment. " 2. Buffett clearly stated that the Apple investment decision was not his. You might want to remove this assumption. Fixed the no more desirable endorsement and made the statement that Combs and Wechsler were the people who decided to add Apple more assertive. I have checked for an explicit statement from Buffett that he was not involved but I could not find it. Do you have a link? "Warren Buffett's Berkshire Hathaway has taken a new stake in Apple and upped its holdings in IBM, according to a Securities and Exchange Commission filing Monday. Berkshire portfolio managers Todd Combs and Ted Weschler, who each invest about $9 billion, made the investments." Buffett didn't make a written statement about this investment but answered orally to questions about this. I haven't searched for these video clips. "Returning more cash to stockholders in special dividends or buybacks can change value either upwards (if the market is discounting the cash on the presumption that the company would waste the cash on bad investments/acquisitions) " - not sure how this works, if a company returns cash the value would decline by the nominal value of cash and the company will no longer have the cash to invest. So how is it that returning cash through special dividends etc can increase VALUE? I understand that the share price may increase after a buyback given that the pie is divided by a lesser number of shares? but value? Prof, you need not have fixed that statement. Whether Combs or Wechsler initiated the buy on Apple, ultimately Buffett gets to see it. If he thought that the company's billion dollar was invested in some unyielding investment, he would have objected. Never mind if he says that it was not his buy. For me, it had his blessings and therefore it was his investment. I wonder how he is able to project a technology business's cash flows now. Apple still has too much at stake what with its pile of cash. That cash could go into iCar or something else. Those new products may click or may not click. I wonder how does Buffett know (cash flows) now that he thought he did not know earlier when Apple was on high-growth phase. On the link to Buffett not being involved in the decision, I did read this article and this could be said about any investment that Berkshire Hathaway has made in the last few years. I think that my rephrasing still stands. To the extent that Buffett hand picked Combs and Wechsler because they followed his rule book and since he has the power to reverse any action that they take, I think that it is fair to view Apple as Buffett's pick, especially since it so resembles the IBM pick from a decade ago. Do you view Apple as a technology company or a consumer products company, today? Clearly, the imprimatur of Buffet was all over this purchase, so Prof D statement of following Buffet stands. Icahn when he bought NFLX said it was his son's purchase. Does one really thing he did not bless a purchase of a large magnitude? Why quibble over such nits? The thesis of this smart post still stands: To follow, or not to follow a guru, that is the question. Regarding Icahn, i see him more as a value guy and not so much a price/momentum guy as his timeframe and the companies he looks to invest in and subsequently buys and holds for multi year periods. His sale of Apple might have been due to seeing limited upside in light of an enormous gain, coupled with a rating agency downgrade of his public vehicle as well as seeing a better opportunity in AGN which when it closes its sale to Teva will have new proceeds equivalent to its current long term debt. So, a stock down significantly in price, coupled with a soon to be outstanding balance sheet strikes me as more of a "value" opportunity, than pricing/momentum play. To be clear, Buffett has said he does not approve or over-rule decisions by Todd and Ted. They make their decisions independent of his approval, and certainly do not seek approval prior to the investment. If it is of any consolation, their investment performance has been superior to Buffett's for many years. That's why they increasingly manage more of the funds. Love your work! Just had a slightly off-topic question. I was wondering what your thoughts are about doing a mid-year adjustment to the valuation? Since the company's revenues (and profits) are generally spread out across the entire year, it would seem to make sense to use the mid-point of the year for the discount rate. However this has led to more debate than any assumptions I can remember. Thanks. Another possible reason that that short term trading could affect long term value is that if the company is is planning to raise significant additional capital in the near future. I am thinking perhaps of a Real Estate Investment Trust (REIT) which issues additional equity regularly, or a company which frequently acquires other companies, or a company which has a large amount of stock based compensation for employees. In those case, the equity holders could be subject to more or less dilution depending on the short term market conditions, and that would affect the value of their shares (and the price). Apple is running on innovation fumes at this point. They aren't even up to their old trick of entering established and growing tech niches. Hi professor! I love your work! Re Apple's news today of liability for Euro 13bil in EU back taxes, how do you treat this in your value? More interestingly how do you treat WACC and post tax DCF for Samsung or Sony (which I assume pay taxes) vs Apple? - Apart from I guess less tax in Apples cashflow pre this news, was there any adjustment for this risk?